Eventide is a trusted supplier of ATC and ATM Voice Recording Solutions. Agencies in more than 50 countries worldwide trust Eventide’s voice recording systems to securely and reliably record, store, archive, quarantine, impound and replay their critically important ATM/ATC voice interactions. Eventide is a proven supplier of ATC and ATM Voice Recording Solutions, with more than 15 years of market experience. Eventide ATC/ATM voice recorders are deployed and operational in Europe, North America, Caribbean, Central America, South America, Antarctica, Africa, Middle East, South Asia and Southeast Asia. Eventide’s advanced NexLog ATC and ATM Voice Recording solutions are the optimum choice for modern recording requirements. NexLog systems incorporate a modular and scalable design, embedded Linux, fault-tolerance, and advanced ED137 (VoIP) recording support. Eventide’s reliable ATC and ATM Voice Recording Solutions include redundant power supplies, redundant hard disk drives and redundant network interfaces. NexLog ATC and ATM Voice Recording Solutions are also available in matched pairs, providing fully-redundant voice recording. Eventide is focused on quality in the design and manufacturing of ATC and ATM Voice Recording Solutions. ISO-9001:2015 certification confirms Eventide’s dedication to product quality. 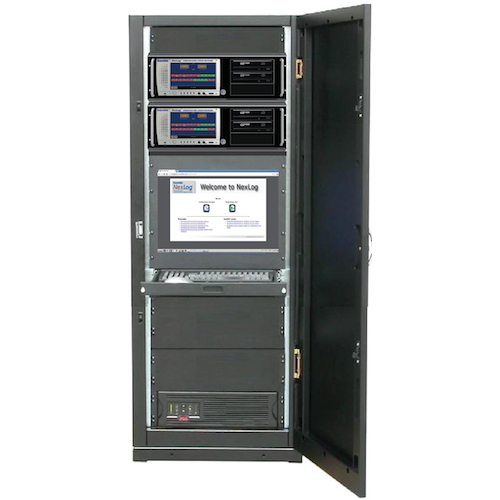 NexLog ATC and ATM voice recording solutions are designed to meet the specific needs of ATM/ATC environments, and feature an open system architecture with embedded Linux operating system, embedded robust SQL database, up to 12 terabytes of internal RAID storage and multiple levels of redundancy. NexLog systems provide accurate voice recording, archival storage, secure and easy access to recordings, and support for quarantine and impounding. Archive storage choices include RDX, Blu-ray, DVD-RAM, USB, Removable HDD, Network Attached Storage (NAS) and automatic replication to other NexLog recorders. NexLog ATC and ATM voice recording solutions are fully scalable from a single ATC site to national deployments with multiple sites and many thousands of channels. 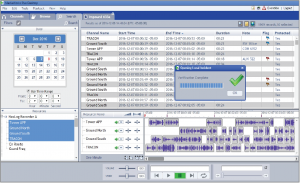 The MediaWorks PLUS software for NexLog recorders provides a complete set of tools to manage each incident’s recordings and to securely control access. Features include multi-parameter search, multi-channel replay, graphical time-line, pitch-corrected variable-speed, loop playback, skip forward/back, audio waveform displays, playback AGC, live monitoring, quarantine, impounding and export. Capabilities include create an incident, name the incident, set access permissions, quarantine recordings, impound & validate, split audio clips, merge audio clips, add voice annotation, add text annotation, add text notes, enable talking time & date, save the incident, export the incident, email the incident, and Burn to CD/DVD/Blu-ray. Web-browser HTML5 interface: Secure search, replay and management of voice recordings and incidents using Chrome, Firefox, Safari, IE9/10 or Edge browsers on Windows, Mac, or Linux PCs. Off-line Windows application: Provides secure validation and replay of impounded files and archives, without a network connection to the NexLog recorder. 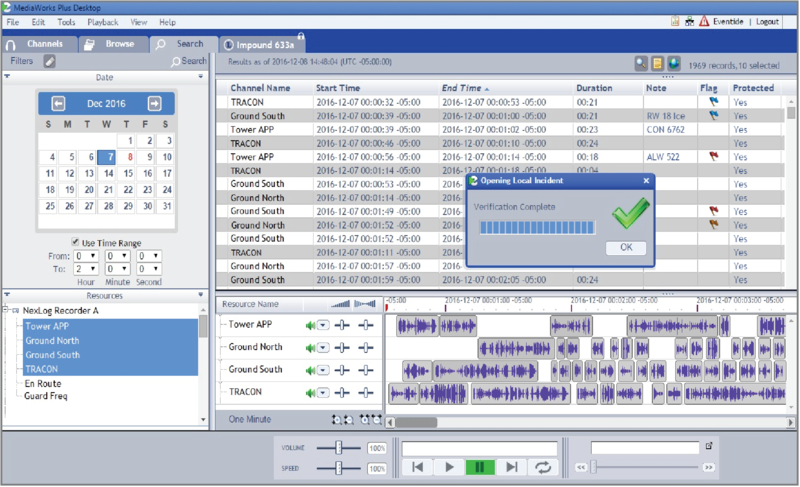 The Windows application also permits secure search, replay and management of recordings and incidents via network connection to one or more NexLog voice recorders. Eventide offers NexLog ATC and ATM voice recording solutions that implement the ED137B/C-Part 4 interface, providing active VoIP recording from ED137-capable Ground Radio Stations (GRS), Controller Working Positions (CWP), and Voice Communications & Control Systems (VCCS). Eventide is a member of the EUROCONTROL VoIP in ATM Implementation and Transition Expert (VOTE) group, and has directly contributed to the ED137 standard for voice recording. Eventide also participates in EUROCAE Working Group 67, which is involved with specifying the implementation of Voice over Internet Protocol (VoIP) for Air Traffic Management. Eventide’s reliable NexLog ATC and ATM Voice Recording Solutions include redundant power supplies, redundant hard disk drives and redundant network interfaces. NexLog ATC and ATM Voice Recording Solutions are also available in matched pairs, providing fully-redundant recording and storage. Visit Eventide during World ATM Congress 2019 – Stand 1139!